Read & React: Are Duck Migration Patterns Changing? Waterfowl hunters love conspiracy theories. "How else can you explain the growing number of hunters who insist ducks are migrating south later each year?" asks veteran Mississippi guide Mike Boyd. It's a common hypothesis, particularly during lean years. Boyd isn't buying it. He says ducks show up later some years, earlier in others. There's no indication long-term migration patterns are occurring later each year based on what hunters see. "It's almost entirely weather-driven. Two things move ducks: snow and ice. They need food and open water and they'll move when they can't get either one," he says. "Some species also migrate by the calendar and not by weather. 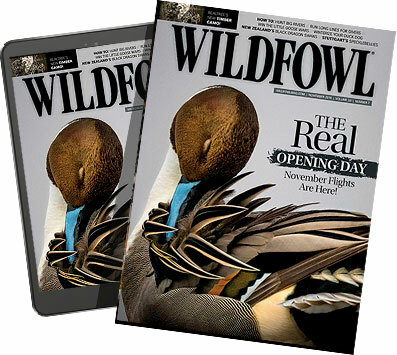 We do very well in the early season on gadwalls, which seem to show up fairly consistently from year to year." Despite Boyd's experience, plenty of hunters in the mid-latitudes are reporting fewer ducks during the early seasons. That could be due largely to a changing climate. Lakes in the U.S. are freezing an average of 5.8 days later than they did 100 years ago, according to a report by the National Snow and Ice Data Center. Average temperatures are rising faster in the winter than in any other season, particularly in the Prairie Pothole Region and Upper Midwest, where winter temps are seven degrees warmer than 30 years ago, according to a 2009 U.S. Global Change Research Program report. Human-related factors are also giving waterfowl more excuses to stay north deeper into winter. No-till farming has created a buffet of corn and beans in the heart of waterfowl country. The increase in electricity generation is also playing a role. Warm water, a by-product of many power plants, creates year-round open water. Combine that with abundant food, and ducks have no reason to head south. And hunters themselves are coaxing ducks to stick around longer thanks to flooded crops and ice eaters. "There's no question ducks are being killed later in the year," says Delta Waterfowl vice president of U.S. policy John Devney. In some cases, they are being killed much later. Is that because ducks are migrating later or are other factors involved? Delta president Dr. Frank Rohwer led a study that examined the timing of state-by-state harvest in an effort to get a handle on migration patterns. On the surface, it does appear ducks are arriving in the southern states later. Hunters in Arkansas, for example, are killing mallards an average of 14 days later in 2008 than in 1961. The shift is even more extreme in Oklahoma, where the average mallard harvest date is 31 days later than it was 50 years ago. With some exceptions, the average harvest dates of all ducks are moving deeper into the season. "When Frank showed me the average harvest dates not just for mallards, but for other species, I just about fell out of my chair," says Devney. Tennessee hunters are killing gadwalls 18 days later, Nebraska hunters are bagging them eight days later and California hunters are harvesting pintails a whopping 30 days later, according to Delta. The harvest for ringnecks was also later throughout much of North America. There's a simple explanation for that, though. Delta's scientists also examined season dates in relation to average harvest dates. Thanks largely to requests by hunters, the U.S. Fish and Wildlife Service allowed states to push seasons farther into January. Those states also restructured splits to allow for a later season overall. Additionally, Devney says seasons are generally longer than they have ever been, too. As a result, the average harvest dates of virtually all species examined by Delta are indeed later. "If you compare the average harvest dates with the average hunting season dates, you'll see that in many cases the numbers are identical, particularly with mallards," explains Devney. "Hunters are killing ducks later in the season because they can." In other words, there is no clear indication ducks are migrating later. However, there is no evidence they aren't. Other data shows no correlation in harvest dates and seasons. In fact, there does seem to be a clear shift toward later harvest in some states, even when season structures are taken into account. That might indicate a delayed migration. California hunters killed mallards and gadwalls 15 days later on average, but the average season date is only eight days later. Similar trends have occurred in Oklahoma, Michigan and Oregon for other species. "There is no across-the-board pattern," notes Devney. "It's very inconsistent for a lot of species and in different regions of the country." State University of New York-Oswego zoology professor Dr. Michael Schummer says the notion ducks are heading south later may be nothing more than perception, possibly because seasons extend longer into the winter. He says ducks do migrate later in some years, but that's hardly a new phenomenon. "If you have three warm winters in a row and birds stay farther north longer, then it can certainly seem like patterns are changing," says Schummer. "However, if those three warm winters are spread out over a 10-year period, then no one notices a trend." Much of his research has focused on weather patterns and waterfowl migrations to determine if ducks are indeed migrating later. He has yet to see a clear pattern. "The data just doesn't show it," says Schummer. "We've had extended periods of unusually cold winter and periods of warmer winters, so hunters in the south might seem to remember those warmer years because they stand out as particularly bad ones." A closer look at Delta's research also failed to show a clear long-term trend, particularly among the southernmost states. Schummer and Devney think that's because there are too many variables to determine if ducks are flying south later. A comparison of mottled duck harvest data and mallard harvest data in Louisiana and Texas muddies the water even more. Mottled ducks don't migrate. Their harvest dates were not consistent with changes in season dates. While the average harvest date remained steady with the season in Texas, hunters were killing mottled ducks in Louisiana an average of 12 days later in 2008. The state's mallard harvest remained consistent with season dates. Boyd figures hunters that see fewer birds during the early part of the season are only witnessing a fraction of the big picture. It's not unusual for hunters in one part of a state to have a banner year while others in a neighboring county are fairing poorly. That occurs throughout duck country. Water, food and other factors all influence duck populations nearly as much as weather. Despite one of the coldest and snowiest winters on record, many south Louisiana hunters experienced abysmal hunting. That could be a result of more food and water in northern Louisiana, or poor habitat along the coast. And it is well-known migration routes do shift east to west a bit as well, but that is another story. However, Schummer says we are seeing more extreme winter weather, making migration patterns even murkier. Cold winters are colder and warmer winters are warmer, creating more uncertainty. "We know weather that causes ducks to migrate is changing," he says. "We just don't know if the ducks themselves are actually migrating later as a result of the change in climate."